Wedding PR: Bridal Guide, New York Times, AllSeated and more! We’re so close to the holidays, we can almost taste the egg nog! We’re starting off the week with another batch of fantastic client features- from Bridal Guide to the New York Times, AllSeated and so much more! See it all below. 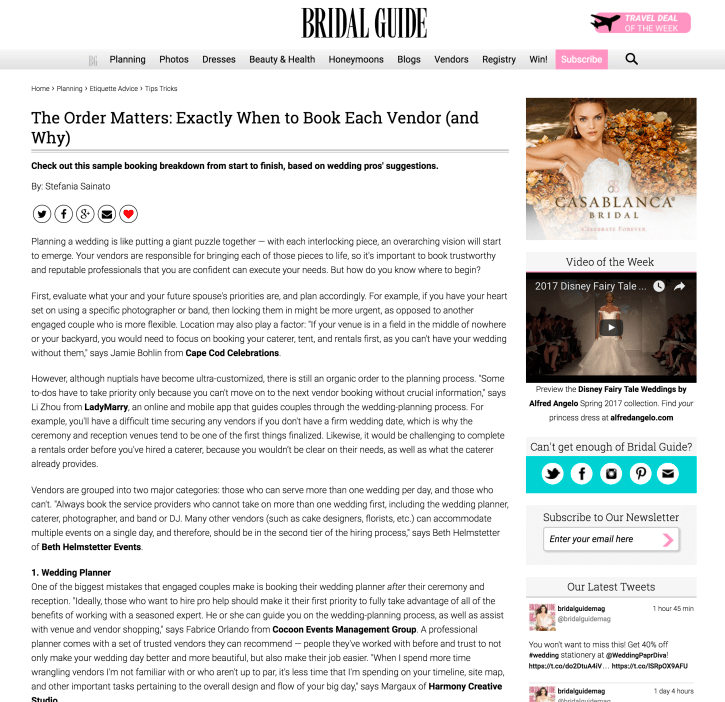 Destination Weddings, Fantasy Sound Event Services, LadyMarry, Cocoon Events Management Group and Bergerons Flowers were featured in the Bridal Guide article The Order Matters: Exactly When to Book Each Vendor (and Why). See the full feature here. LadyMarry was featured on Top Wedding Sites in the article Four Ways Your Phone Will Save You from Wedding Stresses. See the full feature here. 100 Candles was featured on Catersource with their guest article Holiday Lighting Inspiration. See the full article here. Get Polished Events was featured in The New York Times article Entering Your Wedding Day by Parachute, Horse, or Ski Lift. See the full feature here. Taylor’d Events Group was featured on WeddingIQ with her guest article Creating Meaningful Relationships Within Your Office. See the full article here. Belladeux Event Design was featured on Special Events with her guest article How to Turn Your Hometown Into a Wedding Destination. See the full article here. Don Mears Photography was featured on Hill City Bride with a gorgeous Virginia real wedding. See the full feature here. Cocoon Events Management Group was featured on AllSeated with their guest article Luxury Touches for Your Wedding Day. See the full article here.